I dream of sitting by a stream, surrounded with greenery. With the sound of crickets and the flowing water whispering into the stealthy quiet , peace and serenity all around. I and Jaita (my partner in crime and hence to be called J) planned to take a 6 days trip to a place with which we have been associated with, from a distance for a long time. We impart training to youths of Kashmir under NSDC scheme of Government of India. So for us this was a destiny which was waiting to happen. And this was a trip which was planned without our respective families. We started our journey at 7 a.m in the morning and landed at Srinagar at 3.55 in the evening. The banes of cheap flights! Travelled in Travera to Jawahar Nagar where our hotel was. We were a bit disappointed as we had expected a grand view of Dal Lake and realised that we were nowhere near it. The accommodation was good but it was 32 degrees sweltering heat outside in the streets. 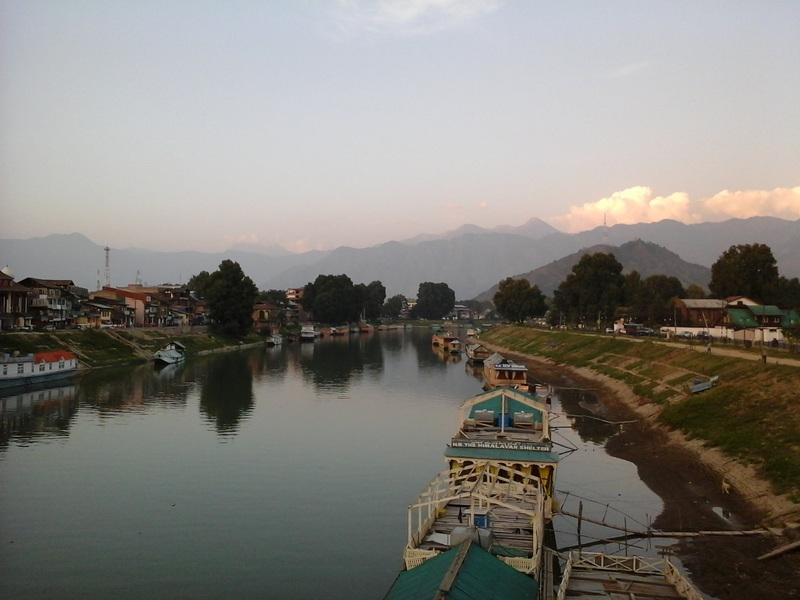 Evening, we decided to take a stroll outside our hotel and with help of a friend discovered the joys of sunset at Jhelum (locally pronounced Jehlum) and just fell in love with the view. We spent some time there and then walked back to the hotel after collecting some necessities ( a forgotten toothbrush, a confused and mixed up camera’s sd card and some food to stay alive) for our onward journey , a day trip to Gulmarg. About Srinagar:Srinagar is composed of two Sanskrit words, śrī (other name for the goddess Lakshmi) and nagar, which means “city”. One theory of the origin of the name is that a Pandava King Ashok (not to be confused with the Mauryan Emperor Ashok) built the city of Srinagari (Srinagar). Another theory is that Mauryan Emperor Ashoka founded the original city of Srinagar, then situated on the site of the present village of Pandrethan, 5 km to the north of the existing capital (wiki). The nearest airport is located at Jammu, which has regular flights to and from Delhi and Leh and flights from Chandigarh and Kolkata, Bombay and few other metros too have direct flights to Srinagar. Rail connectivity for Srinagar is also until Jammu. From Jammu one has to drive 305 km by road. One may opt to travel through Udhampur, which is 230 km from Srinagar and has trains connecting to selected cities across North India. Road networks across the state are well maintained. Road from Srinagar also connect to all major locations in North India including Gulmarg, Leh, Kargil and Jammu within the state, and has Delhi and Chandigarh outside of it. The uniqueness of Srinagar lies in the fact that every season has its own charm. That said, April to June is the most popular time for tourists to visit as the weather is cool and temperatures range between 10 degree Celcius and 30 degree Celcius. Srinagar is also home to Asia’s largest tulip garden. You can see the dazzling rainbow colours of the Tulip Festival in Srinagar during the first two weeks of April. Srinagar transforms into a winter wonderland starting from October and continues till March when temperatures drop to minus 10 degree Celcius. While the frozen waters of Dal Lake become the playground for cricket matches, the slopes of Gulmarg see an ambush of skiers. Srinagar is a year-round destination. People throng the Valley in summers for the cool weather and picture perfect vistas. In winters, tourists love the snow-covered slopes. Many indulge in winter sports like skiing. This entry was posted in Enchanting Kashmir, Nature, Places- Info, Travel Log and tagged Srinagar. Bookmark the permalink. 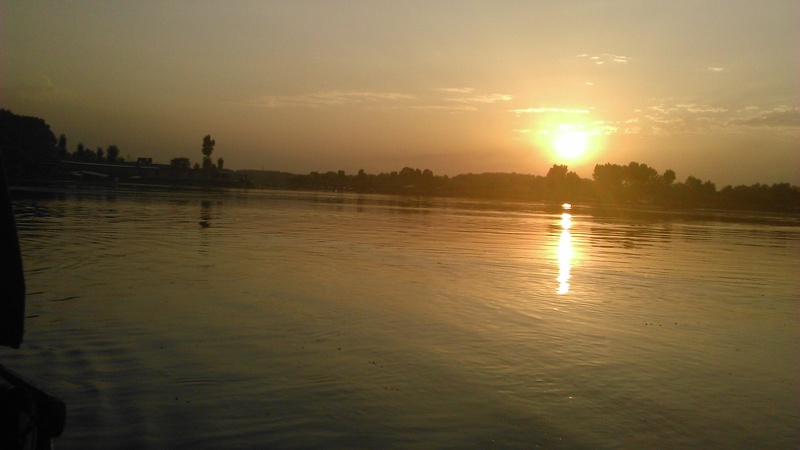 0 Responses to A Place named Kashmir….. It woz really blessing for you az u visited the Heaven of India in the mid season but u have not visited unbelievable wonders & destinations of kashmir like River Veshow, Nilnaag, doodnagin, Kongwattan, ahrabal & many more..
Mam i woz waiting that when u will call me & i will help & guide you in our kashmir but instead of that u did’t even mis call me. Mam it iz our kashmiri tradition & vogue to respect the trainers & teachers like parrent & particularly when they are our guests…. A wonderful attempt. Hope travelers would love to be part of this journey. thanks for the information… that was a good writeup. Thanks Diptee for reading. Will post more. Surely i am going to visit Kashmir in future. I am waiting for that moment. thank you mam for giving this information.